Read other articles in the series. Up here in the high country, there are certain times of the year when one doesn’t want to go out in the field collecting–like summer, because of the scorching sun with its intense UV at these altitudes of 7,200 to 12,000 feet accompanied by swarms of deer flies and black flies that deliver painful bites, –or autumn with all the bees, wasps, and spiders scurrying around preparing for winter while the plants are busy releasing tons of pollen to induce and aggravate respiratory maladies–or winter when everything is frozen or coated with ice and windchill temperatures of -60 F.–or spring when the mosquitoes (carrying West Nile virus) and ticks (carrying Rocky Mountain Spotted Fever) are accompanied by bouts of 50 to 70 mph winds. Don’t get me wrong, I’m not saying that we don’t have perfectly splendid days that are ideal for collecting and I vividly remember that this year we had such a marvelous Spring/Summer day on June 17th and another one (a Summer/Autumn) one on September 29th–and while most of the students and faculty were attending a university football game, I went out collecting in a beautifully peaceful landscape. 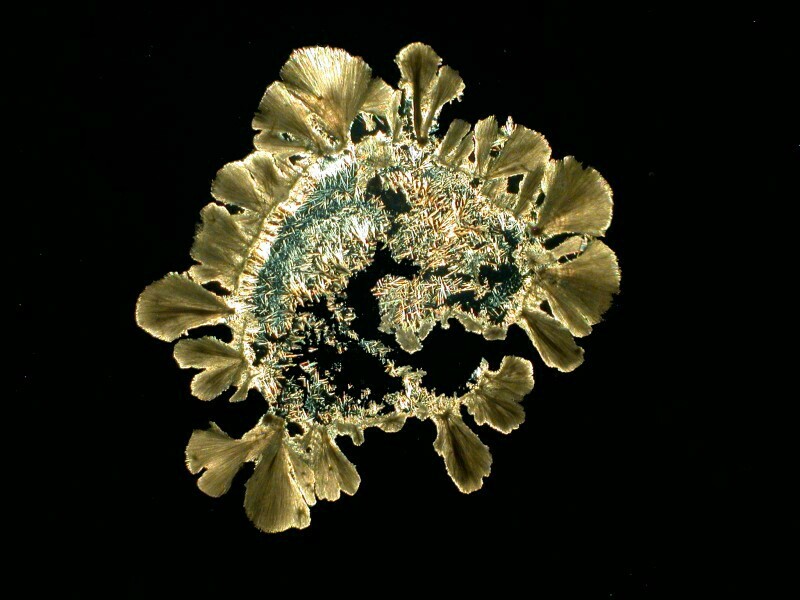 My account is perhaps a tad hyperbolic, but wherever you live, I suspect there are periods when you can’t or don’t want to go out collecting and your pond cultures have dried up and you want to do some microscopy, but you’re just not sure what to focus on. Fortunately, the answer, nay a multiplicity of answers, is at hand. 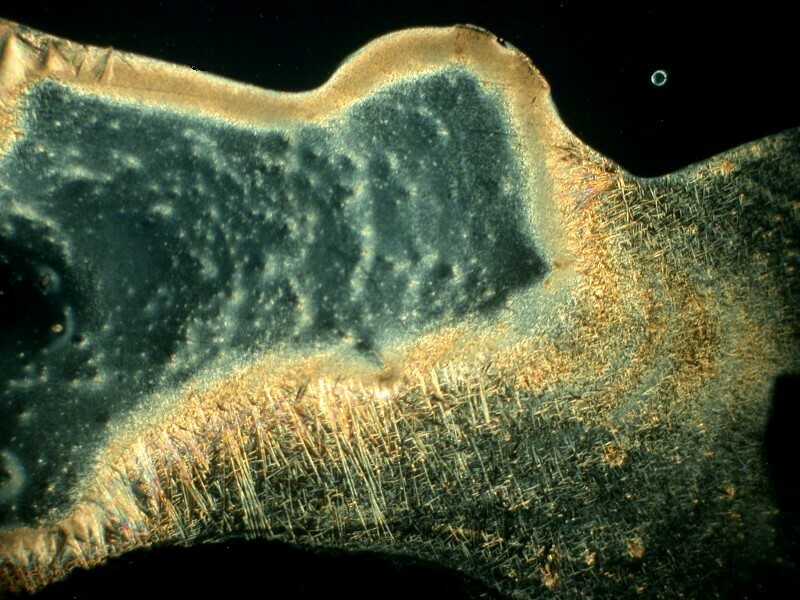 A household can be a treasure trove microscopically and wonderfully multi-dimensional so–everywhere from your medicine cabinet to your refrigerator and even your houseplants are fair game. Let’s start with the medicine cabinet. Ironically, more and more of the items that used to be in a well-stocked medicine cabinet now carry the admonition: “Do Not Store In The Bathroom”. This, apparently, is due to considerations of high humidity and significant temperature variations which “could affect the quality of the product.” Well, use better containers is my answer. My paternal grandmother, who lived with us, lived to be 84, my mother lived to be 97, my father lived to be 100, my wife’s mother is 98 and still going–and, guess where they stored all of those items–in the medicine cabinet, in the bathroom! In any case, most households have an abundance of OTC items, prescriptions, nostrums, and sundries from toothache liquids to wart removers. My eccentric household has, in addition, some things that strictly speaking are chemicals, but with a bit of hunting around can be fairly readily obtained and I’ll mention those as we get to them and try to explain why I think they are worth experimenting with. Now, for those of you who have occasional dyspepsia (not the congenital metaphysical kind rampant among philosophers), I want to take a look at Bromo-Seltzer (a sort of relative of Alka-Seltzer). Bromo-Seltzer dates back to 1890 and was the brainchild of Isaac Emerson. 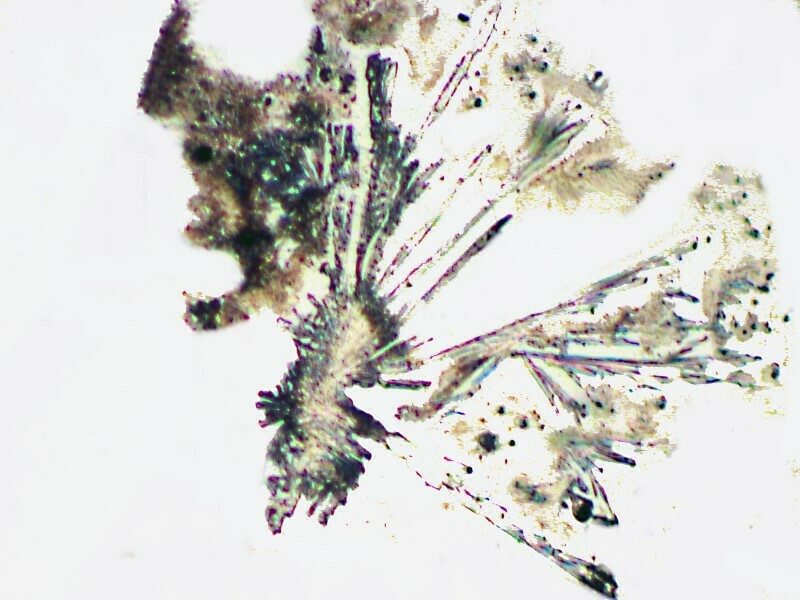 I have an old bottle of it which my friend Nik Berrong of Rocky Mountain Microscope gave me some years back. I examined the bottle and the label with a fine-toothed comb and could not find any date, so I decided to try a magnifier. Still no result. “Fine-toothed comb”–what a funny language English is. 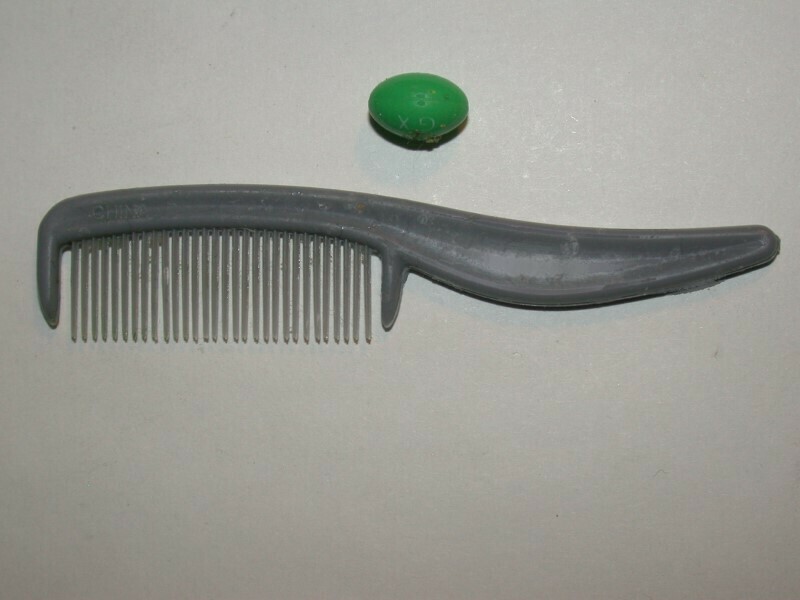 Here’s a picture of mine; the pill is just to show you relative size and that it is indeed fine-toothed. However, the list of ingredients does provide a helpful clue; acetaminophen, phenacetin, potassium bromide, caffeine, sodium bicarbonate, and citric acid. In 1975, bromides were withdrawn from use in commercial remedies due to their toxicity. Later on, in 1983, phenacetin was also banned for reasons relating to toxicity. Bromides have a sedative or tranquillizing effect. Bromo-Seltzer was aggressively advertised as a remedy for both headache and stomach upset and enjoyed immense popularity–enough to make its concocter, Isaac Emerson, a very wealthy man. 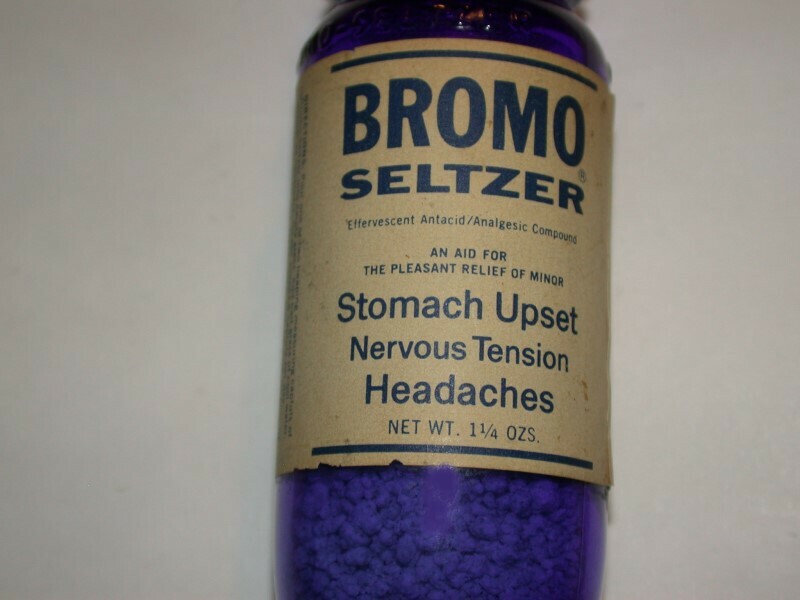 Bromo-Seltzer was later reformulated and reissued consisting primarily of acetaminophen, and sodium bicarbonate and is still available on the Internet. True believers, some of whom have been taking Bromo-Seltzer for 40 or 50 years, extol its superiority over every other gastric and headache remedy believing that it is still the “great stuff” they got in olden days. This period of the late 19th Century on up until the mid-20th Century was geared to aggressive advertising for some rather dubious products, Bromo-Seltzer being just one example. There was advertising for it on matchbook covers, on billboards, postcards, and even sheet music for songs such as “Listen to the Mockingbird” from a collection of 83 different songs under the title of the Bromo-Seltzer collection with a drawing of the famous cobalt blue bottle on the front. Here’s a picture of my bottle. A number of different designs were used over the years, but the color remained constant. However, the capstone was the consequence of a trip which Emerson took to Italy in 1900 where in Florence he was greatly impressed by the Palazzo Vecchio. He had plans drawn up and in 1911, a 15-story tower was erected influenced by his experience in Florence. The 15th floor consisted of 4 clock faces, one for each direction, and each spelled out Bromo-Seltzer (which conveniently has 12 letters) as well as Roman numerals which were, however, less distinctive. Originally, on top was a 20 ton Bromo-Seltzer “bottle” illuminated from inside. It was removed in 1936 because of safety concerns. Now that’s advertising! 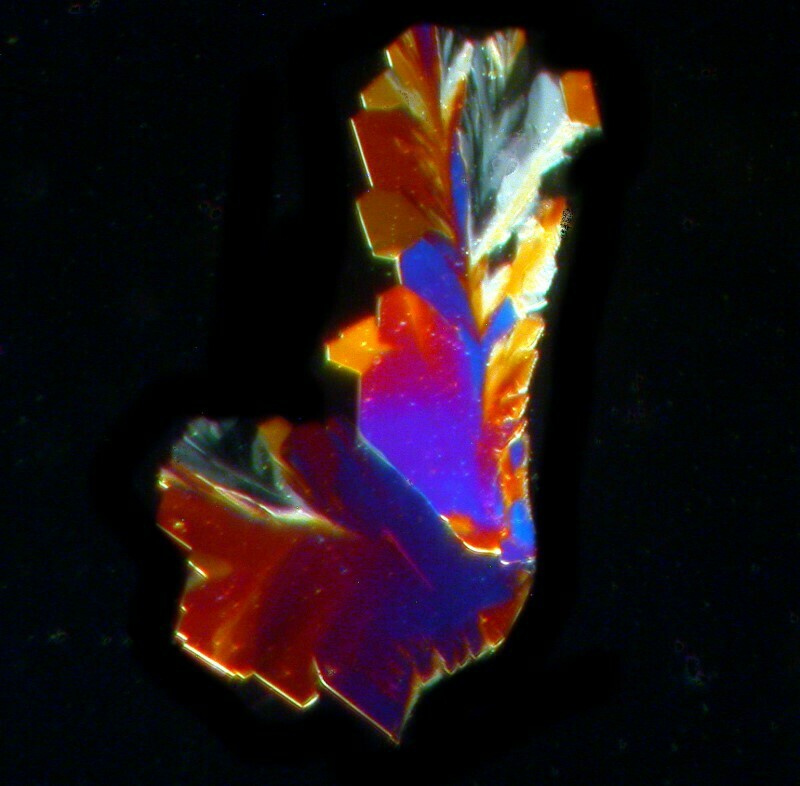 So, now I will show you some examples of some crystals of some of the components of Bromo-Seltzer and most of the images were taken using polarized light to jazz things up a bit; however, I’ll sometimes show you a contrast by also including a brightfield image. The splendid thing about using things that you have on hand is that you can try out various tricks of contrast, lighting, and even mixtures of some kinds of substances like Ascorbic acid (Vitamin C–one of my favorites) and Magnesium sulfate (Epsom salts)–in other words, it can become an elaborate form of play (something that, unfortunately, adults often forget how to do). 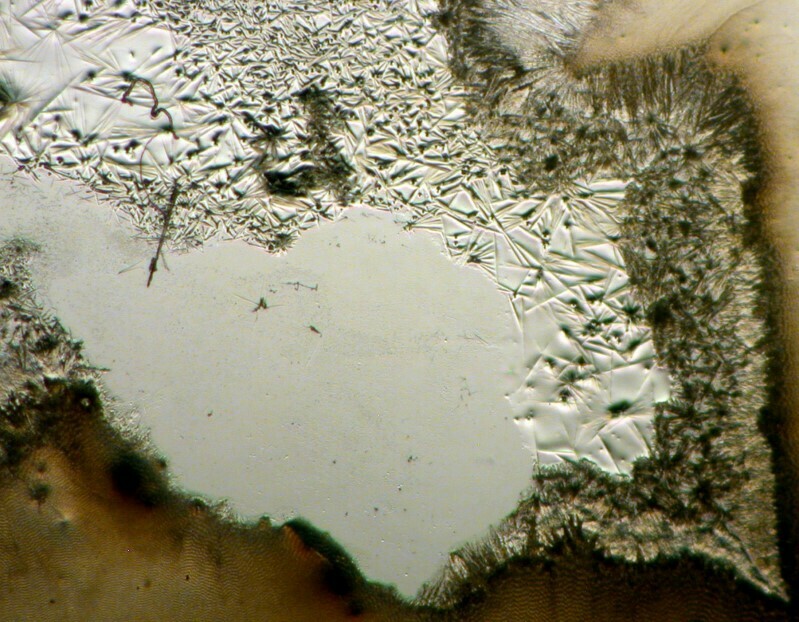 I mentioned previously that the Bromo-Seltzer I have is quite old and seems to be rather quixotic in that sometimes a drop will produce a few disk-like crystals, other times only a blob of particles, and yet other times a crusty crystalline surface. 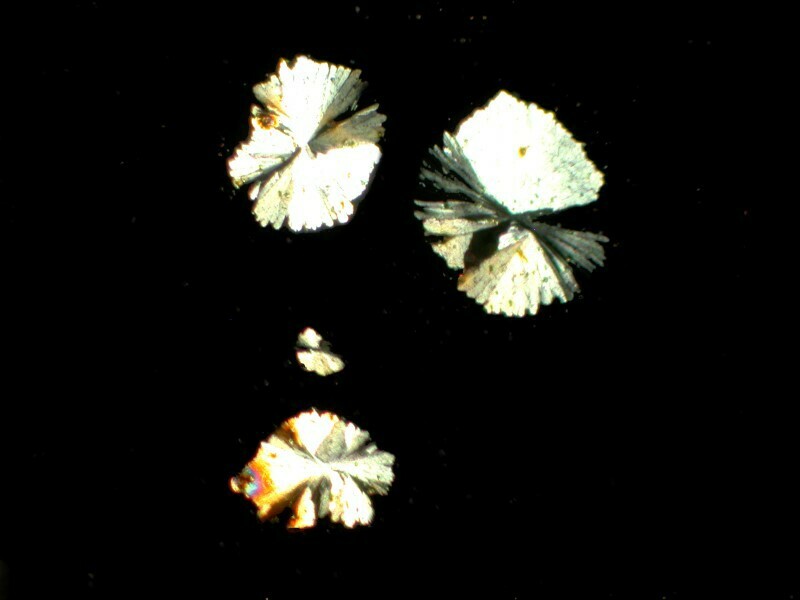 Now, here are some disk-like crystals; the first is a brightfield image and the next one is polarized. The next one is also polarized and taken at a different location on the slide which produced the 2 images directly above. I suspect that rather intricate patterns are a consequence of a concentration of a different set of components since, as you will remember, Bromo-Seltzer is a combination of 6 different chemicals. 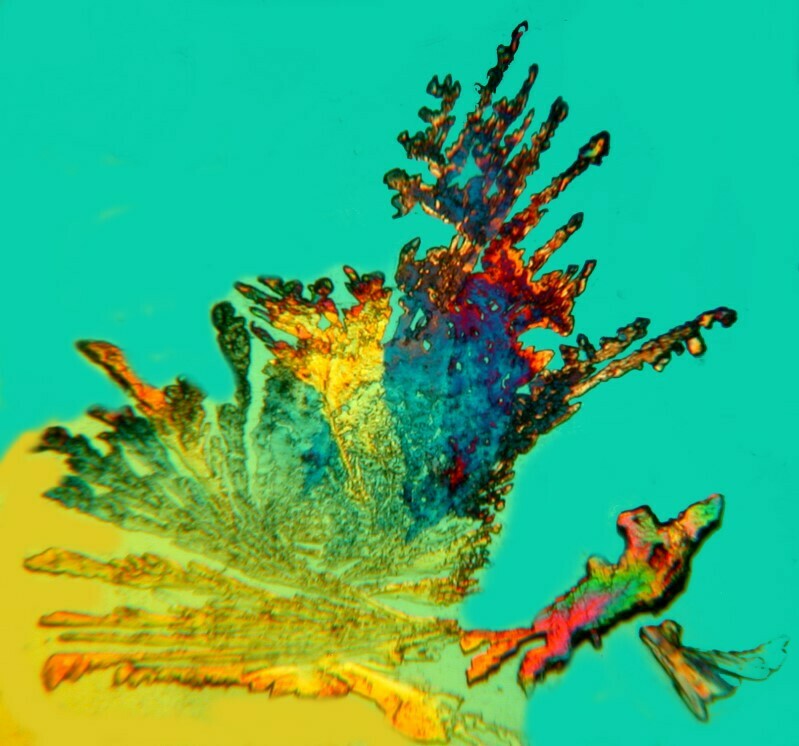 Finally, I mixed in a bit of Ascorbic acid with the Bromo-Seltzer and you can see the rather colorful result below. 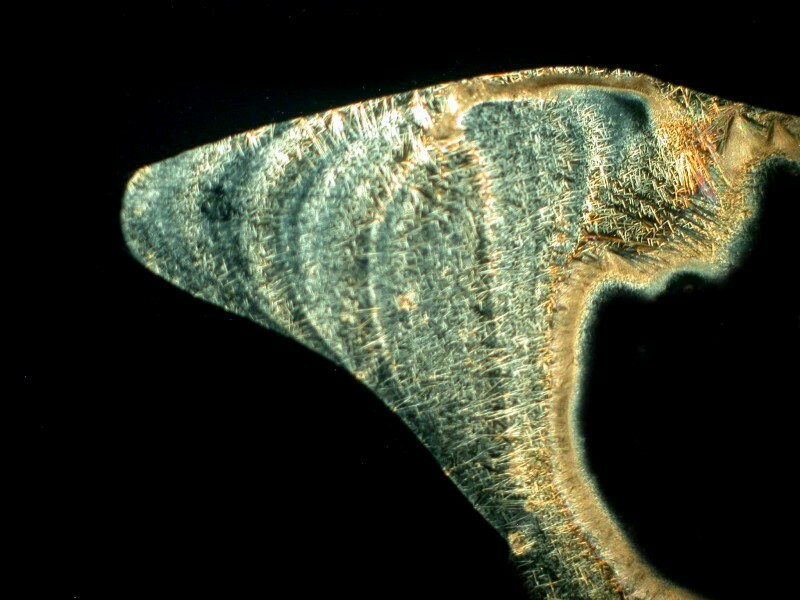 The second image is a closeup of a portion of the first. Almost everyone is familiar with acetaminophen (Tylenol, et. al.) which was an ingredient in Bromo-Seltzer. Although it is still common in OTC medications, recently warnings have increased regarding its potential to produce kidney damage. 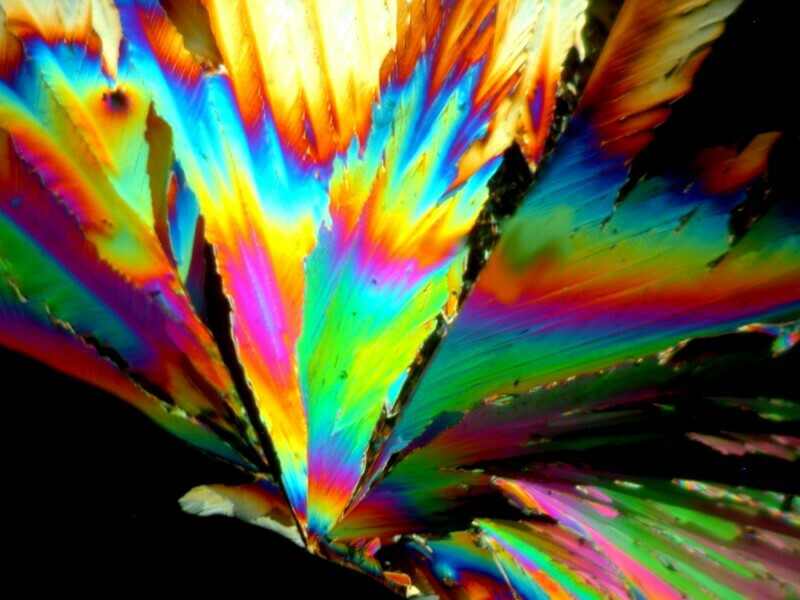 Acetaminophen is a polymorphic substance and produces a variety of crystal forms as we shall see. First off, once again we can find crusty blobs. 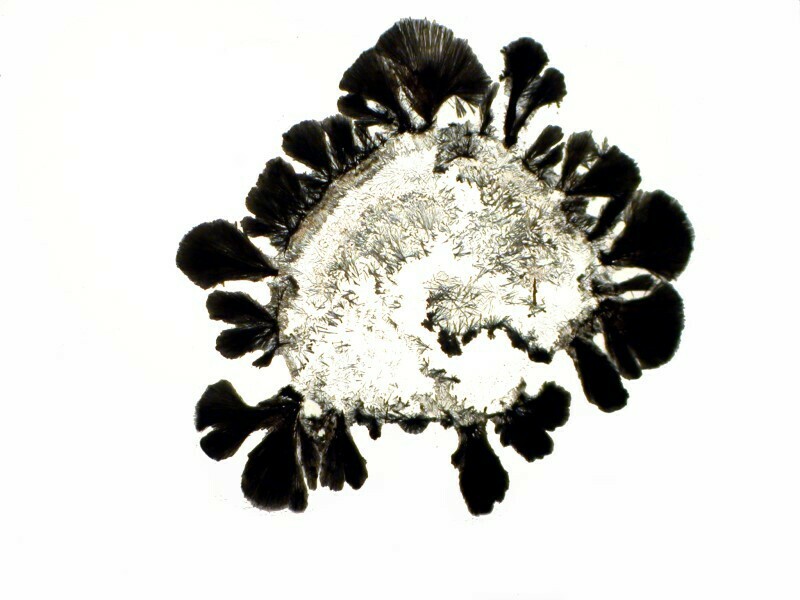 Or an elegant fan-like cluster. Or possibly ideograms that outdo Chinese. And if we polarize one of the “fans”, we get this. Another ingredient of Bromo-Seltzer is sodium bicarbonate (baking soda). Its interaction with Citric acid (which we’ll look at after this) is what’s responsible for the effervescence when Bromo-Seltzer is mixed with water. Some people take baking soda for stomach upset which involves ingesting a lot of sodium which is not so good for blood pressure and the heart, so another strike against Bromo-Seltzer. 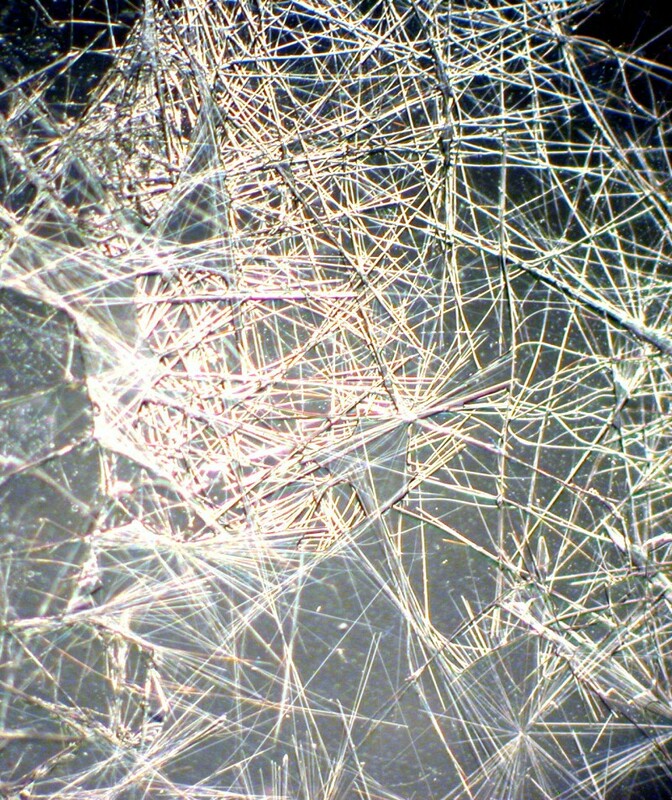 Typically sodium bicarbonate forms acicular (needle-like) crystals as you can see from the image below. 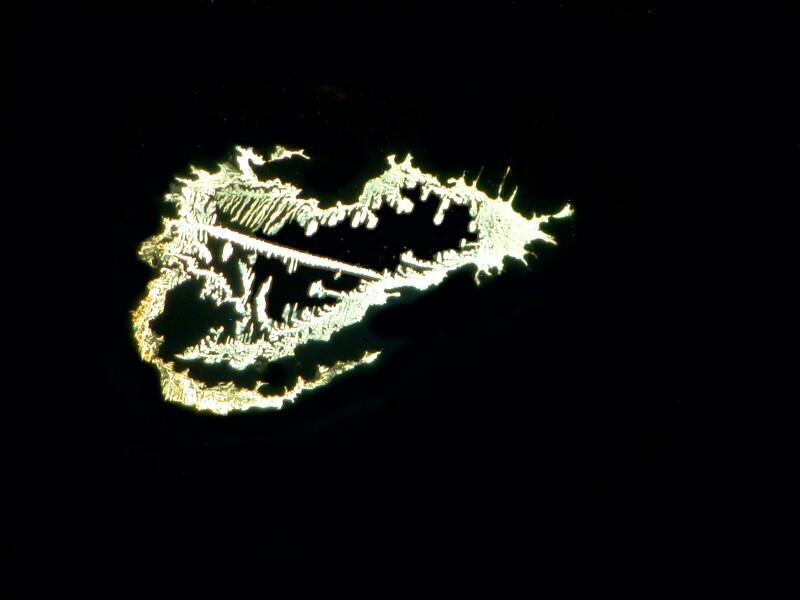 However, sometimes with a dilute solution, thinly spread over the surface of the slide, you may get what looks like an abstract pencil drawing or a sketch for a wire sculpture. 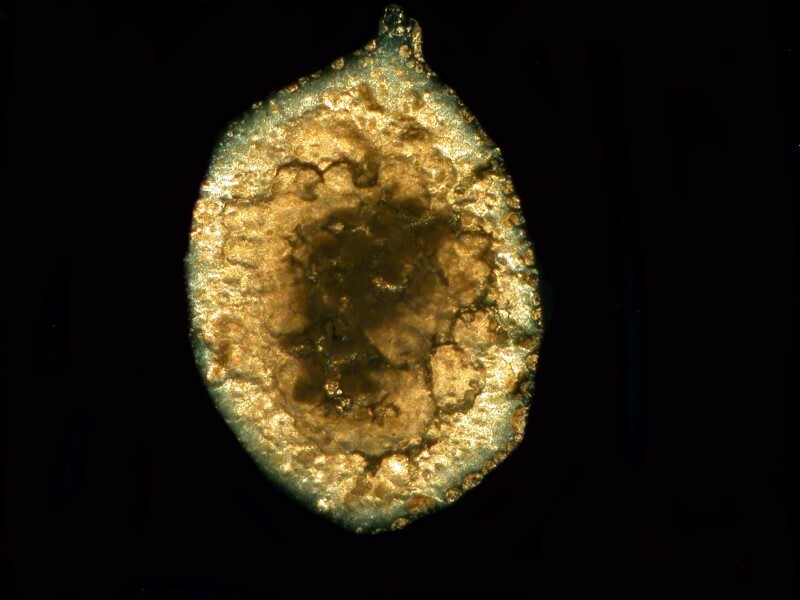 Often you can get such a thin spread by adding a tiny drop of 70% isopropyl alcohol to the drop on the slide. 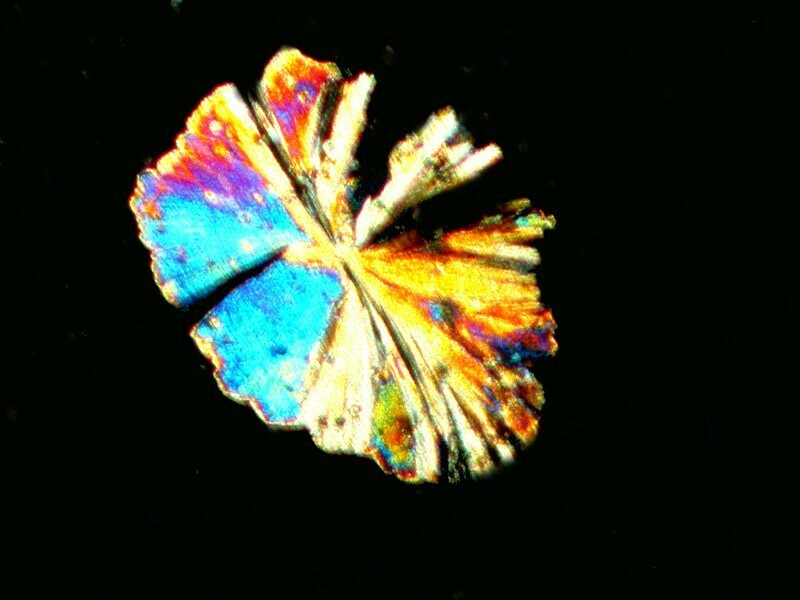 Ordinarily when I am making up slides of crystals, I don’t cover them with cover glasses which some of my friends find quite eccentric. However, it does speed up the drying process, particularly if you’ve added a drop of alcohol. 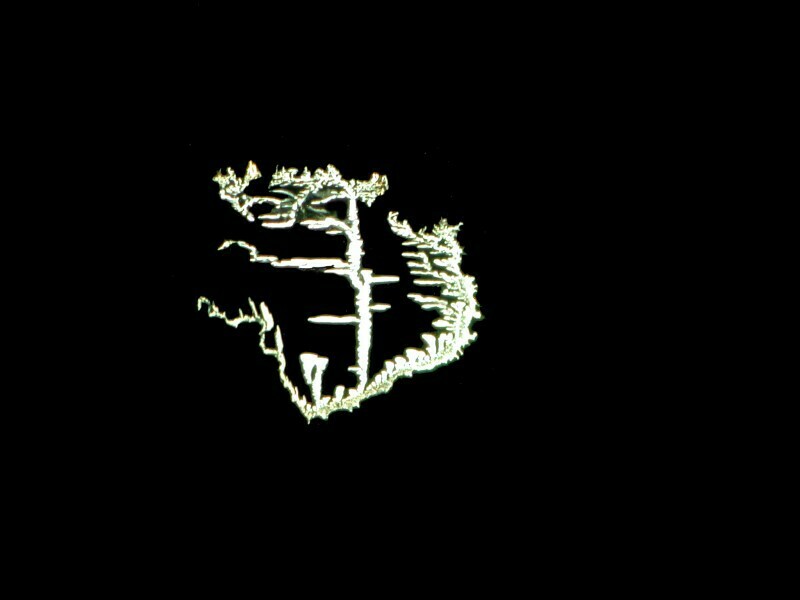 Occasionally, though, a cover glass will produce some interesting results especially around the edges as is the case below. 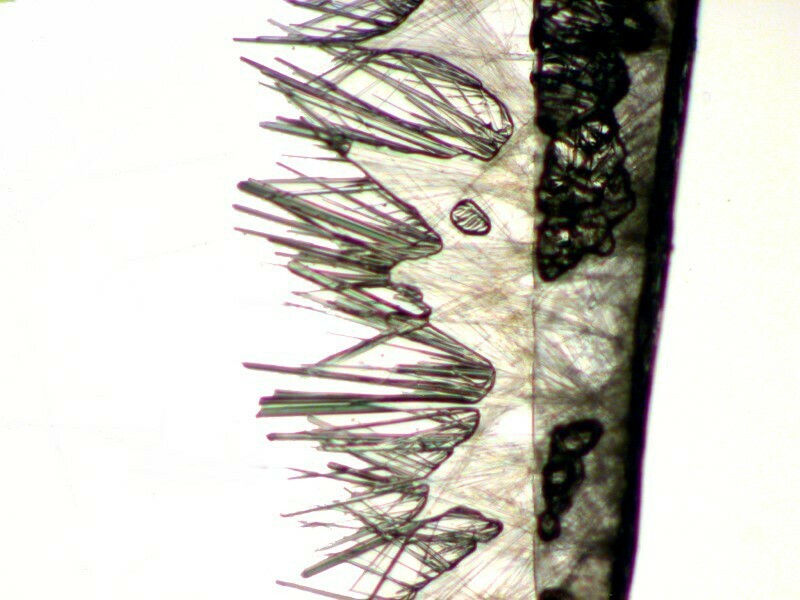 The crystals are still acicular but they bundle in a different way. 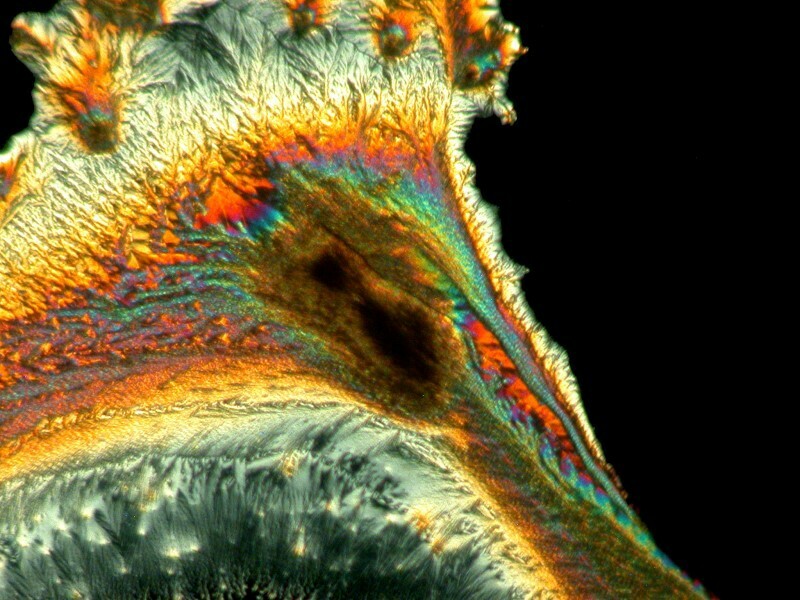 If we place a typical cluster under polarized light, then we can see that the tiny needles take on a wide range of subtle colors. Yet another ingredient is caffeine. 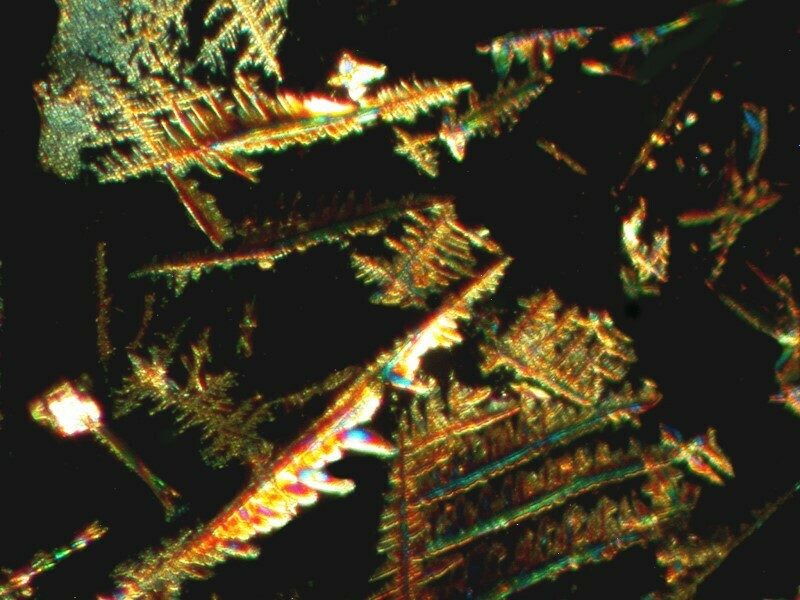 Caffeine also typically forms acicular crystals, but it’s tricky stuff because they can clump to form fan-like structures. 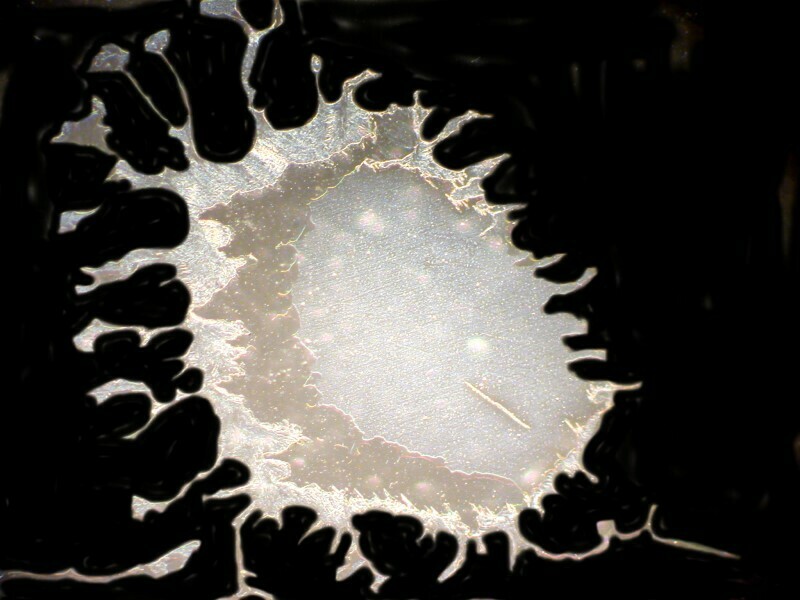 The first image is from a slide made with a cover glass and it is a brightfield image and you can clearly see the “needles”. Now I’ll show you 2 images where bundling into fan-like structures has taken place and yet you can also see needles in the central area. 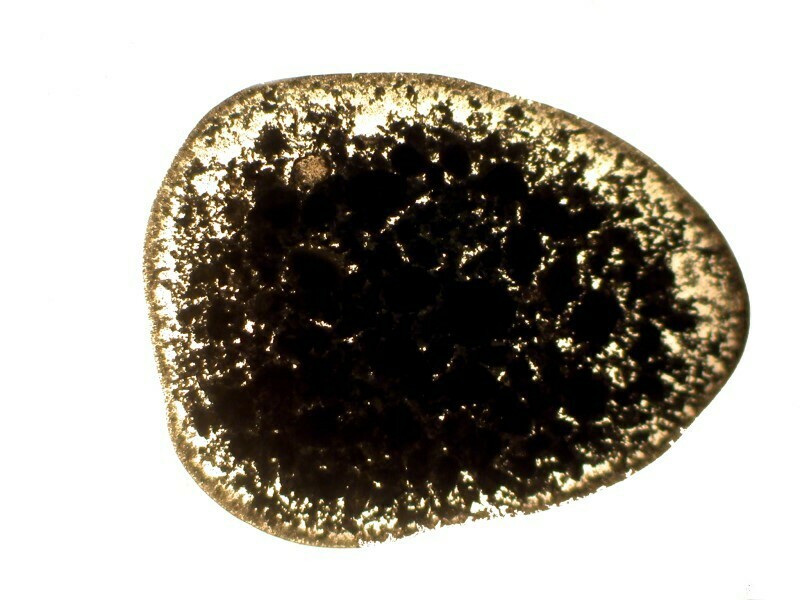 The first image is brightfield and the second is polarized. 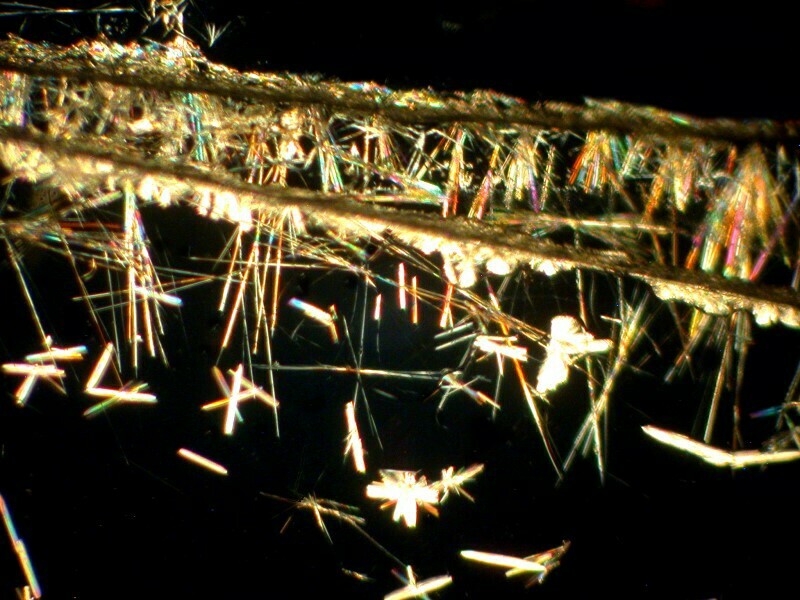 No wonder your coffee keeps you awake; all these little needles running around in your system. Now, let’s see what happens if we mix caffeine with Acetaminophen which is also in Bromo-Seltzer. 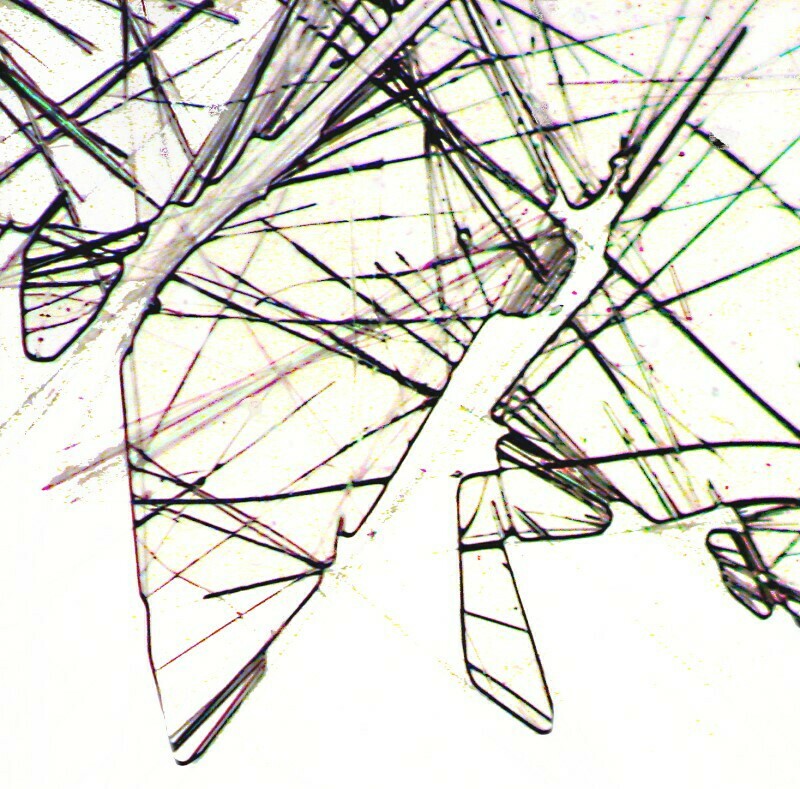 The result is that we get very weird shapes which are, if we look closely, composed of enormous numbers of needles. Here are 2 views. O.K., let’s look at one more component of Bromo-Seltzer, namely, Citric acid, the stuff in your orange juice and lemonade. 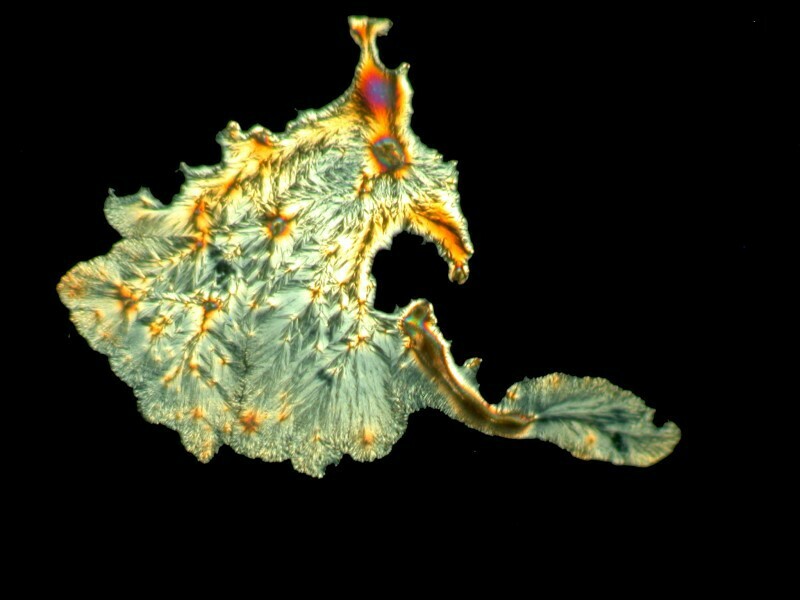 In its pure form when dissolved, it tends to form almost a syrup and sometimes is not very cooperative about producing crystals. 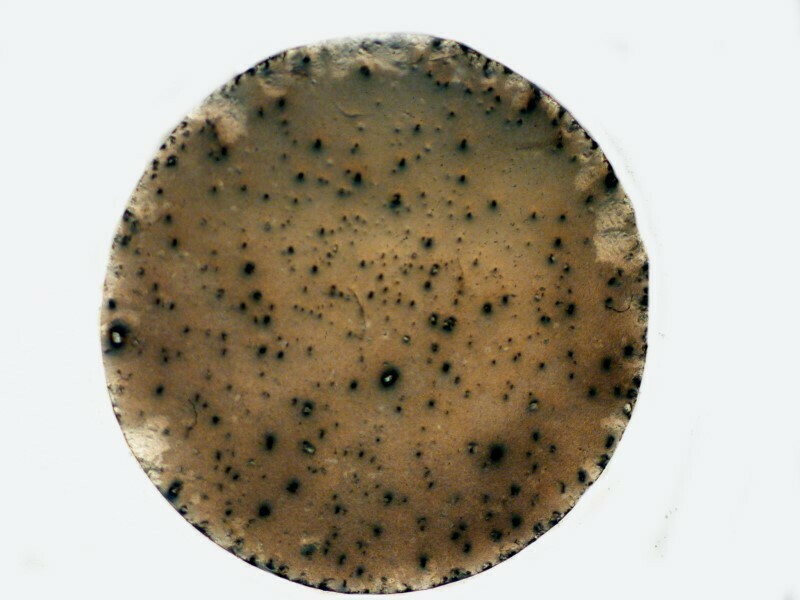 However, it is well worth persisting because the results can be quite striking as you can see in the two examples below (both polarized). As for the last 2 ingredients, I don’t have access to Phenacetin nor Potassium bromide. Both are toxic and both have been banned from use in OTC medications. Phenacetin wasn’t banned until 1983 by the FDA as being carcinogenic and a significant cause of kidney damage. Potassium bromide was banned in 1975. It was widely used to treat epilepsy and nervous disorders and is still used by veterinarians to treat epilepsy in dogs. In humans, it has a relatively long half-life in the blood of over a week and as the drug accumulates, it can produce extreme side effects–a state like severe alcoholic intoxication, ataxia, tremor, cerebral edema, and delirium to mention a few. However, in lower dosages such as found in OTC concoctions like Bromo-Seltzer, it often had a calming and soothing effect that its users found very pleasant and they would come to rely on it as a means of coping with stress. I take a Vitamin C tablet every day as a supplement to maintain my general crankiness, since I have always been convinced that the “C” stands for “curmudgeon.” I have the bottle here in front of me on the kitchen table and the list of ingredients is as follows: Ascorbic Acid, Starch, Cellulose, Hydroxypropyl Methylcellulose, Crospovidone, Stearic Acid, Rose Hips, Magnesium Stearate, Silicon Dioxide, Hydroxypropyl Cellulose. The label also tells me that no preservatives or artificial colors have been added—wow, that’s a relief. Now, I suppose a pharmaceutical researcher would tell me that the Starch and Cellulose help hold the Vitamin C crystals (ascorbic acid) together in order to make a tablet and that Methyl Cellulose is Cellulose that’s inebriated on wood alcohol. Crospovidone is irritable povidone, which is a small Italian sausage. Stearic Acid and Magnesium Stearate are to enable you to drive your car better. Rose Hips? I didn’t even know they had legs! Silicon Dioxide—no wonder these tablets are so hard to swallow if they’re putting sand in them. And Hydroxypropyl Cellulose is, I suppose, Cellulose on steroids. Often labels distinguish between active and inactive ingredients, but not this one—just a list, so I assume they’re all, in one way or another, subtlety working their wiles on my delicate torso—including my hips. Silly? Yes, but there are lots of things in our brave new hi-tech world that are both irritating and worrying. This will be an important consideration in a later part of this discussion on another month. In the next installment, we’ll take a look at Alka-Seltzer and the company that produced it which also produced a “tonic” called Nervine and this will lead us to a brief investigation of “patent medicines” which enjoyed an extraordinary popularity especially in the later half of the 19th Century and the first half of the 20th Century. Published in the November 2015 edition of Micscape Magazine.